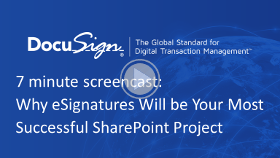 DocuSign Signature Appliance (formally know as CoSign) seamlessly integrates the number 1 digital signature solution with SharePoint Online. Adding digital signatures to SharePoint keeps approval-based workflows electronic from start to finish, streamlining processes while saving time and money. Easily sign, verify, approve, accept and audit documents managed by SharePoint Online from the SharePoint Online user interface. 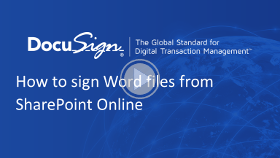 Digitally sign all document types: Word, PDF, and Excel. Comply with regulations worldwide, meeting the needs of organizations in even the most tightly-regulated industries. 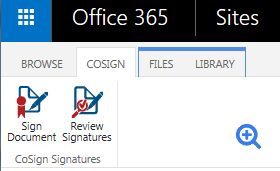 From the SharePoint Online document library, use the CoSign ribbon to digitally sign PDF, Word, and Excel documents. 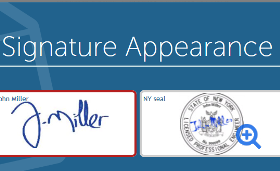 You can also review and verify your document's signatures. The Signing Ceremony enables the signer to authenticate, choose signature options, and sign the document. Sign up for a free trial of the connector. DocuSign Signature Appliance for SharePoint Online is built and supported by DocuSign, Inc. Contact DocuSign today at [email protected] or 1.877.720.2040. At Microsoft we help people and businesses throughout the world realize their full potential. We make this simple mission come to life every day through our passion to create technologies and develop products that touch just about every kind of customer.